Track your Omaha ring game and tournament play across all of the major poker sites with PokerTracker 4 Omaha. This tracking software will import hand histories from your Omaha or Omaha High/Low games and report back stats on yourself and your opponents. Track your play and also have a real-time heads-up display at the tables to give you the maximum edge over the competition. Omaha is a hot game right now online since many feel that the edge in No Limit Hold’em is practically gone. But, in today’s world of hand history tracking and real-time heads-up display (HUD) stats, you can be at a serious disadvantage if you don’t have the right tools at your disposal. Enter PokerTracker 4 Omaha. If you don’t have PokerTracker 4 right now, you can buy the Full Omaha edition for $99.99 or the Small-Stakes edition for $59.99. The Full Omaha and Hold'em version is $159.99, while the Small-Stakes Hold'em and Omaha version is $99.99. Considering the price and what you are getting in return, even for recreational Omaha players, this software seems like a very wise investment. 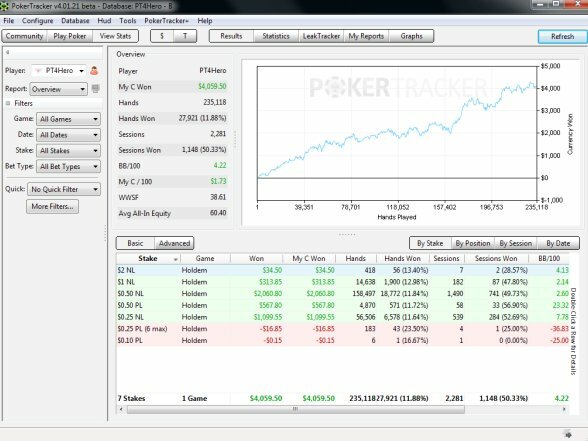 PokerTracker 4 Omaha tracks both cash games and tournaments by importing and parsing hand history files from major online poker sites. If you are already familiar with PokerTracker for Hold’em, then you’ll be very comfortable with the Omaha edition. Essentially, it’s the same product, only it tracks Omaha hands. There are plenty of stats and reports you can run and, at the same time, you can download and install custom stats and reports for free from the PokerTracker repository. If you have time, you can even take a crack at creating your own custom stat or report. All of the bells and whistles you’d expect from the folks at PokerTracker have been stuffed into this Omaha edition. There’s a full player summary with a ton of stats and you even have stats broken out by limit. You can look up your own stats or look up villains you regularly battle it out with to find holes in their games. You can then make notes right from the general player stats page, which will then show up within the “Notes” icon in your HUD. The HUD is extremely powerful and fully customizable. You can configure what stats appear in the HUD, where they are placed, put in a color range for each specific stat, and even change up the fonts. The HUD also has popup boxes if clicked on so you can get even deeper. The HUD is real-time, meaning that it updates and reports fresh stats after each hand you play. One final feature we’d be remiss not to mention is the hand replayer. It’s easy to use, easy on the eyes, and will replay hands from your database. This is a fantastic tool for improving your Omaha play. If you are an Omaha player or just thinking of jumping into these fun and wild poker games, then investing your money in PokerTracker 4 Omaha is a no-brainer.